← How to convert Webpage to PIC? 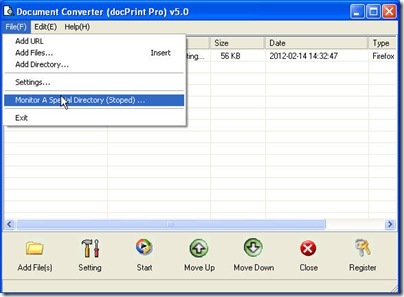 Document Converter is made to help those who need to do the conversion from one file format to another daily. It can convert all the printable files to image files or PDF file. In this article, I will take converting HTML to pcx for example to show you how to use this converter. If you are old friends of us, please ignore these steps. If you are a newer, please follow my steps tightly. When you download this software successfully, there will be an icon on the desktop. Please double click it to enter its interface. Here let begin the conversion from HTML to pcx. Firstly, add files to it. Pick up all the files needed converting in a folder. Press the option “File” on the top then choose “monitor a special directory”. By this way, you can make this directory monitored. Once you add files to it, the files will be converted to pcx at once. If you just need to converter a small fraction of files, you just need to put the files on the desktop then drag them to the software interface. Secondly, choose the output file format. Click the button “Setting”, then you can enter the menu option. In the “Base setting” sub menu label, you can set the output file format as pcx. In the “Save image mode” sub menu label, you can adjust the image resolution and color depth. If you have finished the setting part, you can back its main interface by clicking the button “OK”. Thirdly, choose the output folder. When you have finished all the setting work, you can run the conversion from HTML to pcx by clicking the button “Start”. Once click it then you can choose a folder to save the converted files. The conversion only last three seconds then you can use the converted files, No matter how many files you have added, it can finish the conversion in a very short time. This is the end of the conversion. Thanks for your reading in advance. How to convert OpenOffice to PDF file? How to convert a web page to pcx?